Preheat the oven to 220°C, gas mark 7. Roast 75g coarsely chopped, unsalted macadamia nuts for 5 minutes until toasted. In a bowl, mix 1 tbsp plain flour, 50g fresh white breadcrumbs and 40g melted butter and the toasted nuts. 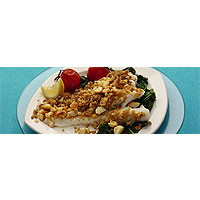 Brush 4 x 180g skinless cod fillets with 1 tbsp walnut oil, season with salt and pepper and top each fillet with the nut mixture. Bake in the oven for 7–9 minutes until the crust is golden brown and the fish is cooked through. Serve with a squeeze of lemon, some wilted spinach and roast tomatoes.